Size: They have a length of 33–39 cm (13–15 in) and a wingspan of 76–85 cm (26–30 in). Weight: The weight is 86–127 g (3.0–4.5 oz). 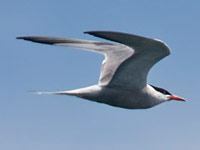 The Arctic Tern is a seabird of the tern family Sternidae. This bird has a circumpolar distribution, breeding colonially in Arctic and sub-Arctic regions of Europe, Asia, and North America (as far south as Brittany and Massachusetts). The species is strongly migratory, seeing two summers each year as it migrates from its northern breeding grounds to the oceans around Antarctica and back (about 24,000 miles) each year. This is the longest regular migration by any known animal. 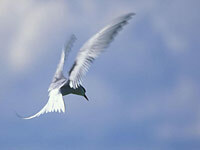 The arctic tern flies as well as glides through the air, performing almost all of its tasks in the air. 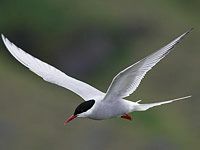 The arctic tern lands once every one to three years (depending on their mating cycle) to nest; once they have finished nesting they take to the sky for another long southern migration. 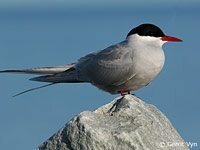 Where does the Arctic Tern live? 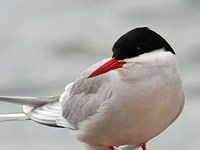 The Arctic Tern has a worldwide, circumpolar breeding distribution which is continuous; there are no recognized subspecies. It can be found in coastal regions in cooler temperate parts of North America and Eurasia during the northern summer. While wintering during the southern summer, it can be found at sea, reaching the southern edge of the Antarctic ice. The species' range encompasses an area of approximately ten million square kilometers. 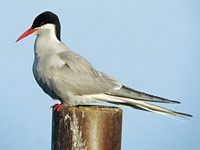 What do Arctic Terns eat?. 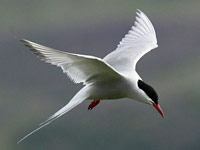 The diet of the Arctic Tern varies depending on location and time, but is usually carnivorous. In most cases, it eats small fish or marine crustaceans. Fish species comprise the most important part of the diet, and account for more of the biomass consumed than any other food. They eat animals such as herring, cod, sandlances, and capelin. Among the marine crustaceans eaten are amphipods, crabs and krill. Sometimes, these birds also eat molluscs, marine worms, or berries, and on their northern breeding grounds, insects. Download free Arctic Tern wallpapers, click on the image to open the large version. Print free Arctic Tern coloring pages, click on the image to open the large version.